Thank you from Joined by Stitch! Joined by Stitch had a lovely time chatting with friends old and new last night at the Andover Memorial Hall Library. Thank you to everyone who came out… and thank you to the folks at the Herb Farmacy for having a talk during the same time frame. There’s definitely cross interest between the herb and the fiber art worlds! Sue Colozzi took photos of the exhibit earlier this month, but don’t settle for pictures! 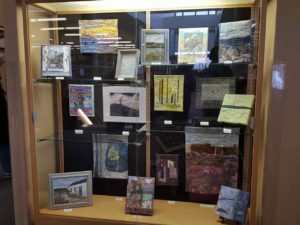 The exhibit is up through April 30. Meanwhile, here’s a little teaser of the small quilts. I feel lucky to hang around such vibrant fiber artists.